Increasing sunlight intensity extends the sleep duration and results in a longer midday siesta which delays the resumption of activity to the evening. What sounds like an analysis of the effects of the unusually hot summer of 2018 is actually the result of the latest research conducted by scientists from Würzburg and the USA. The neurobiologists studied the impact of different light intensities on the circadian rhythm of Drosophila , also known as the common fruit fly. 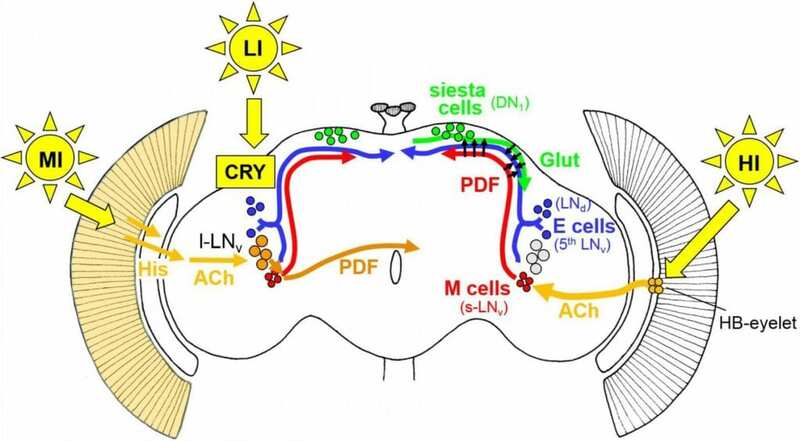 “We were able to show that low, medium and high intensity light synchronizes the circadian clock in the fly’s brain to the 24-hour day,” Charlotte Helfrich-Förster describes the central conclusion of the paper in a nutshell. The professor holds the Chair of Neurobiology and Genetics at the University of Würzburg. Her research focus is on chronobiology which refers to the periodic (cyclic) phenomena in living organisms. She led the study together with her former PhD student Matthias Schlichting, who presently works in the laboratory of Michael Rosbash, winner of the Nobel Prize in Physiology 2017, at Brandeis University in Waltham, Massachusetts (USA). The team published its results in the current issue of The Journal of Neuroscience. The experiments showed that high-intensity light visibly affects the activity pattern of fruit flies. The effect was most striking in the “siesta”, which was an hour longer on average but at least 30 minutes. This led to a delayed start of the customary evening peak of activity, causing the flies to set off one to two hours later than usual. The scientists were also able to pinpoint the culprit responsible for the behavioural change at the molecular level: special photo receptors outside of the retina, known as Hofbauer-Buchner eyelets or short HB eyelets. These microscopically small “extra eyes” – each consists of just four sensory cells – were discovered only 30 years ago by the Würzburg biologists Alois Hofbauer and Erich Buchner. “We were able to demonstrate for the first time that the Hofbauer-Buchner eyelets respond to high-intensity light and make the flies extend their afternoon nap,” Helfrich-Förster explains. They achieve this via a multi-stage signalling pathway: The HB eyeletsHB use specific acetylcholine receptors to increase the calcium level in a sub-group of the clock neurons. As a consequence, the neurons release a special neuropeptide in the dorsal part of the fly brain, the “pigment-dispersing factor” (PDF). There PDF mediates the activity of further clock neurons that regulate the length of the siesta and control the start of evening activity. The scientists believe that the fruit fly’s response to high-intensity light makes sense. “It is an essential mechanism to avoid strong and possibly harmful light in the middle of the day,” the neurobiologist explains. After all, high light intensities frequently occur on hot summer days that can be harmful especially for insects – for one thing because they dehydrate quickly and also because they can be spotted more easily by predators in bright daylight. To exclude the possibility that the extended siesta might be caused not by the light intensity but by the associated warm temperatures, the scientists also ran their experiments on a control group of genetically modified flies. The circadian clock of these flies no longer responds to temperature variations, but the flies still exhibit the behavioural change. This backs the assumption that the light intensity is responsible for the longer siesta and the delayed evening activity. According to the researchers, the results of their study show “surprising parallels between Drosophila and the mammalian system”. Mammals – and humans, too, by the way – have specialised photo receptors that perceive intensive light and forward the signals directly to the circadian clock in a special area of the diencephalon (hypothalamus). It is not known whether their activation causes humans to take a longer afternoon nap, too. But the scientists believe that this is quite possible.